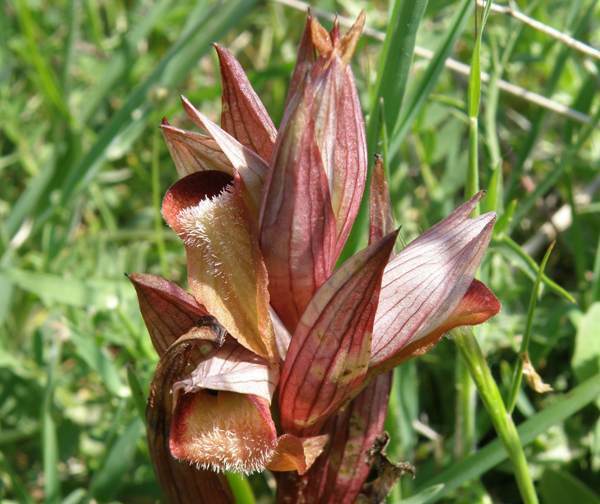 This orchid is very similar to Serapias orientalis but is endemic to Puglia in Italy, where it occurs along the coast and on Monte Gargano. Identification can be tricky as Serapias vomeracea and Serapias cordigera both occur in the same places. The autonomous Serapias neglecta is reported from France, Italy, Corsica and Sardinia where it is localised and rare. 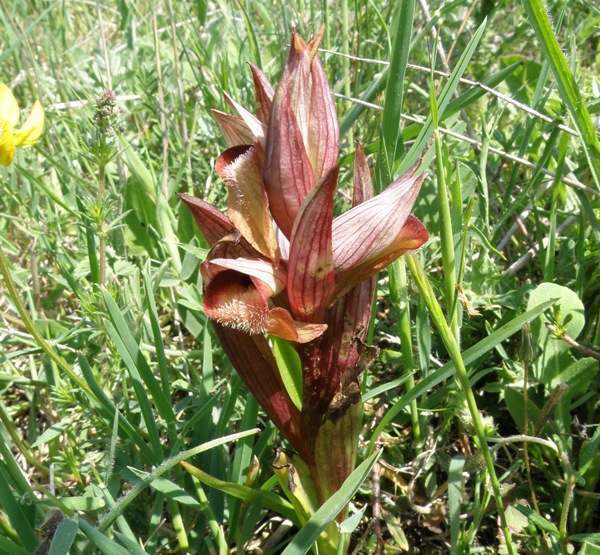 The Plant List treats Serapias apulica as a subspecies of Serapias neglecta, giving the taxonomic name Serapias neglecta subsp. apulica. Serapias apulica is a shorter and more robust plant than Serapias vomeracea growing to around 30cm tall.There are up to 7 narrow, pointed leaves at the base of the stem and smaller bract-like leaves higher up. Each inflorescence has up to 7 large flowers packed together. The flowers have a dense patch of whiteish hairs spreading down the lip from the base. The lip colour is generally paler than the brick-red sepals and petals with darker veins running vertically and laterally throughout. Endemic to the coast of Puglia in Italy. Serapias apulica grows in short, poor grassland that is dry-to-slightly-moist, on alkaline substrates, garrigue and on abandoned farmland in open, sunny positions. It is fairly localised but can occur in large colonies. These orchids bloom from early March until the end of April, and the plants on this page were photographed on Monte Gargano in the middle of April.